By 1974 I had seen almost every rugby playing nation, in the flesh, apart from one exception, and a very major exception at that ! South Africa, and Springbok rugby had been shunned by the world due to their government’s policy of apartheid, hence the Springboks had not played in Wales, or the UK since 1970, a period of some twenty-four years. In 1970,Gareth Edwards slid over in the Cardiff mud to give Wales a 6-6 draw with South Africa, Wales had played the Boks 7 times, lost 6 and drawn 1, not a great record, and that was the last we saw of them on these shores. As a child in Wales, the South African team were thought of as huge brutal men, playing rugby on the high veld, on bone-hard pitches and battering everyone in sight, the only team that could possibly match them were the All Blacks, and a match between those two sides was always regarded as the World championship decider, akin to Ali and Frazier. I had seen grainy footage, and press reports of Oke Geffin, Dawie De Villiers, Jan Ellis, Avril Malan, Syd Nomis etc etc, and had caught some footage of Naas Botha playing in the cape but I had a burning desire to see one of the greatest rugby nations in the world with my own eyes. So for me the twenty-four year wait, on top of a lifetime of tales passed on by uncles just made the men in green take on an even more mystical air, and my anticipation was at fever pitch. 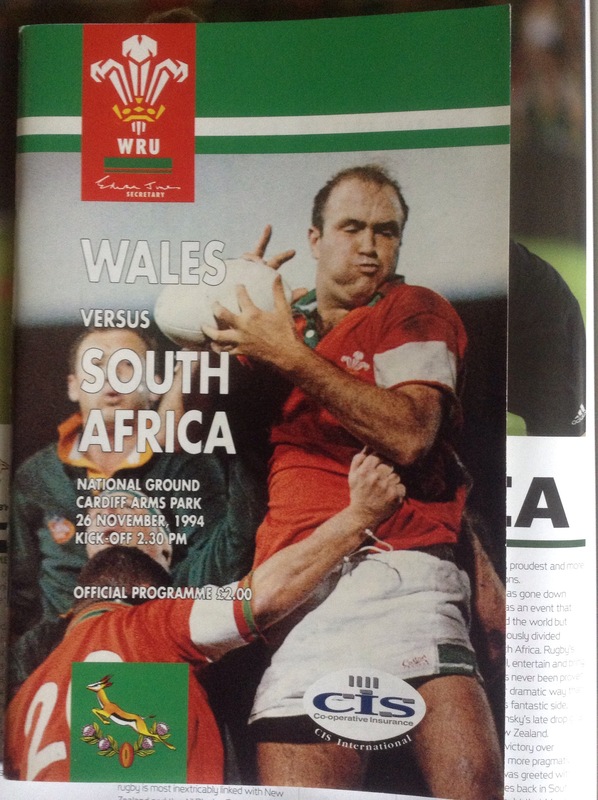 So, at Cardifff Arms Park on 26 November 1994, a somewhat unknown, to me anyway !, South African team took the field to a standing ovation, little did we know that the following year, the bulk of this side would lift the Rugby World Cup, and their names etched in rugby history, and indeed social and world history for ever. On that dark November day, my world was lit up by a young 26-year-old from Transvaal, Francois Pienaar, leading out the bottle green jerseys with the gold Springbok on the left breast glinting in the murky Cardiff gloom. Now I have cried at many rugby matches, the tears I have shed for Wales are immeasurable, but this time I cried for South Africa and the realisation of a dream. Wales sent in to a 12-0 lead, through four Neil Jenkins penalties, and actually led 12-10 as the match entered its final quarter, but in the end tries by Strauli, Joubert and Chester Williams, along with Hennie Le Roux’s conversion and penalty, gave South Africa a 20-12 win. As I look at the match programme, in front of me now as I write, I see a team of men, of whom so many individual stories,of heartbreak, and joy were to be revealed as the years unfolded. 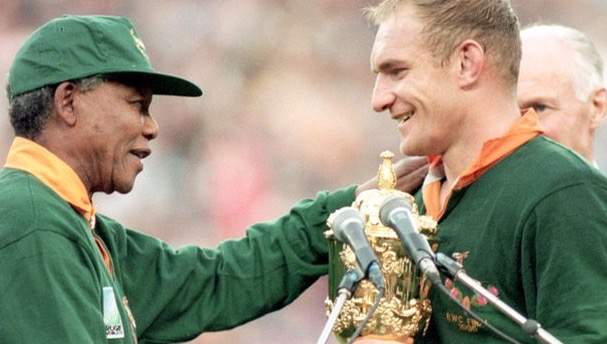 Images of Francois Pienaar, who I was lucky to meet many years later, and Nelson Mandela at RWC 1995 will forever be part of twentieth century history. Unfortunately sad tales also ensued, with Ruben Kruger being taken from us far too early, and the courageous, inspiring, and yet heartbreaking sight, of Joost Van der Westhuizen battling with motor neurone disease even as I write this article. 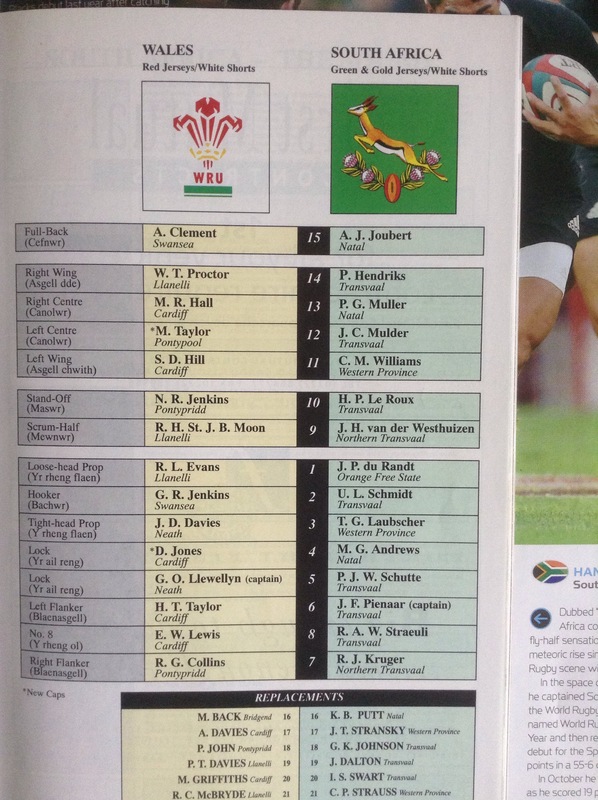 I have seen many more Wales v South Africa clashes since that day, including one at Wembley stadium, whilst the Millennium Stadium was being built in 1998, and the great names have continued, Andrews, Botha, Matfield, Smit, Burger, Teichman, Skinstad, Habana, Smith, and I could go on and on….and usually do ! So as the 2015 Rugby World Cup edges ever closer, I am looking forward to see how the current batch of Boks, perform on these shores, and as I watch, I will pay homage to that very special day in Cardiff thirty one years ago.